Cambridge Primary School’s Teacher in Charge of Chickens Erin Bracken, with students Emmalyn Brough, Margaux Loyer, Alon Rachmani and Sophie Kelly with rescue chickens Hei hei, Spring, Primrose and Big Bird. The initial feeling when you arrive at Free as a Bird’s sanctuary in Whatawhata is one of heartbreak. The enclosure contains numerous hens, devoid of feathers, with pale drooping combs and a somewhat lost demeanour. Then you realise these are the lucky ones, the ones that have been rescued by Aisha Lichtwark, the current organiser of Free as a Bird. Free as a Bird was started by Kelly Phelps of Mamaku in 2014. She rescued thousands of hens from local battery farms before handing over the reins to Aisha in early 2018. Raglan born and bred, Aisha was raised on a lifestyle block and developed a passion for animals at a young age. Having seen the conditions in a battery farm, she was already driven to do something to rescue some of these hens. The new HQ is on some land in Whatawhata and Aisha is actively rescuing in the local area. She hopes to build up her rescue numbers over time. As a busy mum with two young boys, she gives as much as her time as she can to the project. After each rescue, Aisha has her hands full with the new arrivals. They are usually around 12-18 months old and have never seen the light of day before. They have no idea how to behave like chickens and have health problems associated with sitting on a cage floor, with little room to move, and being exposed to constant light so they lay twice-a-day. Many have very few feathers, sore legs from manhandling, overgrown claws, pale, floppy combs, and abscesses and injuries. Aisha trims nails, treats skin complaints, worms them, and feeds them high protein diets. “Those first couple of days, we have to literally show them how to go to bed and perch, and encourage them to peck food from the ground, and how to find the water,” says Aisha. It gives Aisha the greatest pleasure to see the hens starting to behave like hens. At two weeks after rescue, most are ready to go to loving homes. It may be some time before their feathers grow back completely and they are laying daily again, but the hens have a good two to three more years of laying in them if they are treated well. Free as a Bird relies on donations and there is a cost to adopting a chicken. Many people donate over and above the requested amount, something Aisha is most grateful for as she often dips into her own pockets to fund the venture. “I hope that what we are doing raises awareness of what is happening with animal welfare and makes people think about where their food comes from,” says Aisha. She’s also committed to educating the next generation about animal welfare. 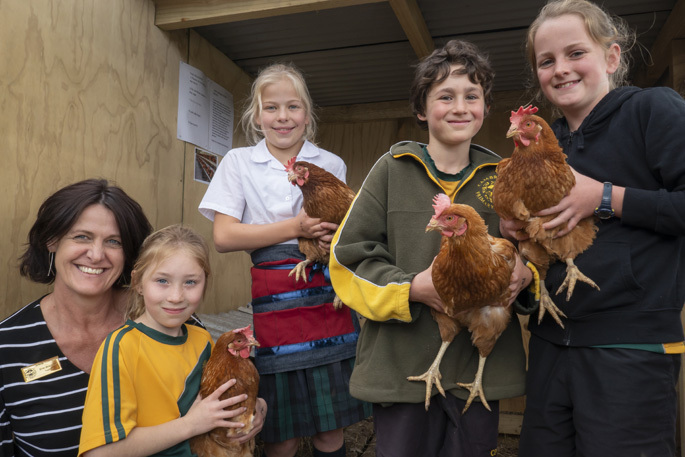 Several schools have taken rescued hens, including one in Rotorua that did a Chicken Club day this year and is keeping the 84 hens to lay eggs for fundraising. Cambridge Primary School recently rescued four chickens as part of their Enviro Schools projects. Teachers in Charge of Chickens, Erin Bracken and Mitch Pettit explain how the chickens have impacted the school. “The whole school community has got behind this project and have been amazing. Our wonderful caretaker Ian Lewell built the enclosure to the children’s plans, and we have a class in charge of their day-to-day care. Aisha posted a moving piece on Facebook, after a particularly gruelling rescue, where she lamented that she could only take a handful of the 1600 birds there in appalling conditions. “An old man walking along a beach came upon a boy sifting through debris left by the night’s tide. Every so often, he would pick up a starfish and toss it back into the sea. “When asked what he was doing the boy said: ‘The tide has washed the starfish onto the beach. They will die unless I throw them back’. The old man looked around and said: ‘There are more starfish here than you can ever save, you can’t make a difference’. The boy bent to pick up another starfish and smiled: ‘I know, but I can make a difference to this one’. To learn more, see ‘Free as a Bird Rescue’ on Facebook or phone: 027 688 6877.